Alfred workflows are very flexible and can be used for a huge range of actions. Workflows can become out-of-date, especially when they work alongside third-party applications, so check if the developer has released a new update or posted about a known issue. 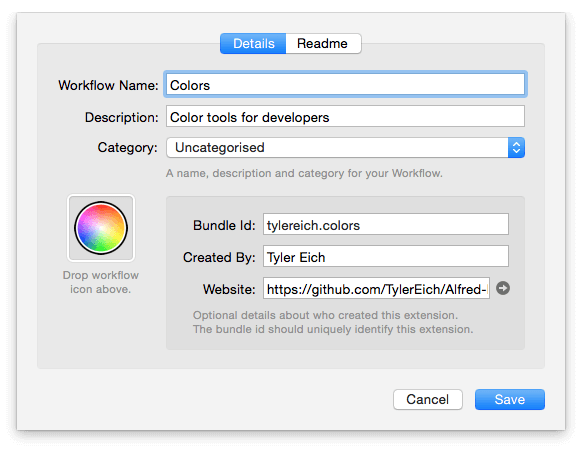 If the developer has provided details, you'll find then by double-clicking on a workflow name in the left sidebar of Alfred's Workflows preferences. If these details aren't filled in, check on Packal or on the Alfred Forum for more information about the workflow. If you're unable to find a source for the workflow, post on the forum in "Workflows Help & Questions" with as much information as possible, so that fellow Alfred users can help you troubleshoot your issue with the workflow. This section refers to the hotkeys set in workflows, rather than Alfred's general hotkey or the ones used for built-in features like Clipboard History and iTunes Mini Player. See the documentation for that particular feature if you need support on hotkeys unrelated to workflows. Why is my hotkey not working? Is your workflow enabled? If the workflow is greyed-out, right-click the name of the workflow in the sidebar to re-enable your workflow. Is your hotkey object connected? The hotkey needs to be connected to the action you want it to perform. In the hotkey object, is the correct hotkey set? If no hotkey is displayed, or it isn't the hotkey you expect, double-click the Hotkey object, set your hotkey and save it. Does your hotkey specify Related Apps? In the hotkey's dropdown sheet, under "Related Apps", check whether you've dragged in applications to specify when the hotkey should be active/inactive. Can I use the same hotkey in multiple workflows? It generally isn't possible to use the same hotkey to perform different actions in different workflows, as it would be easy to forget that you've used the same hotkey elsewhere, causing it to trigger unwanted actions as a side-effect. However, you can connect multiple actions to a single hotkey within a single workflow. By keeping these in one place, you can ensure that your hotkey only performs the actions you intended it to. In the rare case where a workflow containing a hotkey is disabled, it becomes possible to set the same hotkey in another workflow. Please be careful as this can cause unwanted double-actions when you re-enable the first workflow.